Supporters of urban farming — a type of urban agriculture that emphasizes income generation — view it as a productive use of vacant land, increasing access to fresh produce and contributing to local economies. Yet its viability depends on gaining "community buy-in" (i.e., the acceptance and active support of local residents). While recognized as important to the success of socially oriented programs, information is lacking regarding effective processes for gaining community buy-in. Through participant observation at urban farms and interviews with urban farmers, neighborhood leaders, city residents, and key stakeholders in Baltimore, Maryland, we explored the perceived importance of community buy-in for urban farming, as well as the barriers, facilitators, and strategies for gaining such buy-in. 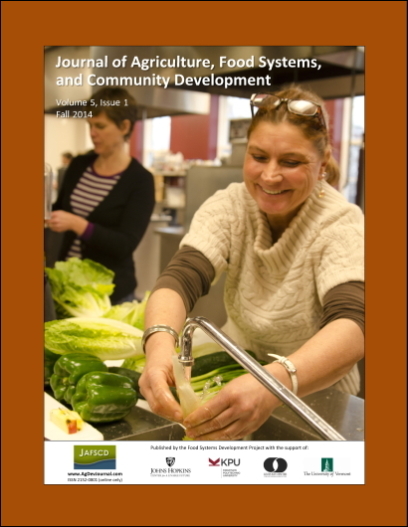 Findings reveal consensus regarding the importance of buy-in, justified by farms' vulnerability to vandalism and the need to align farm services with local residents' desires. Barriers to buy-in include unfamiliarity of residents with urban farming, concerns about negative impacts on the neighborhood, and perceptions of urban farms as "outsider projects." Buy-in is facilitated by perceived benefits such as access to fresh produce, improvement of degraded lots, employment and educational opportunities, the creation of community centers, and community revitalization. Strategies urban farmers use to gain community support followed three main phases: (1) gaining entry into a neighborhood; (2) introducing the idea for an urban farm; and (3) engaging the neighborhood in the urban farm. We make recommendations based on these three phases to assist urban farmers in gaining community buy-in and discuss themes that can be applied to community buy-in processes more broadly. 615 North Wolfe Street, Baltimore, Maryland 21205 USA. Human Nutrition Program, Department of International Health, Johns Hopkins Bloomberg School of Public Health, Baltimore, Maryland, USA. Social and Behavioral Interventions Program, Department of International Health, Johns Hopkins Bloomberg School of Public Health, Baltimore, Maryland, USA.